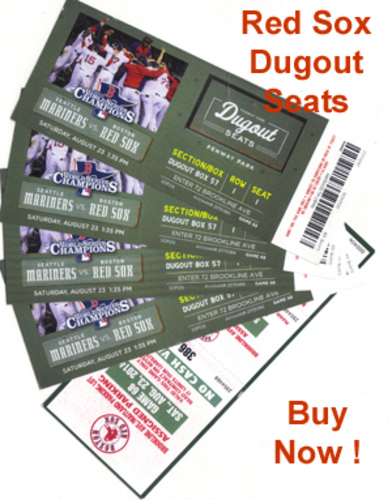 Four Dugout seats to see the Red Sox vs. Mariners game on Saturday, Aug. 23, 2014. Through a generous donation, these 4 Red Sox Dugout seat tickets are available to buy now for $1,750. Parking is also included. Proceeds from these tickets are a part of the 2014 All-Star game fundraising campaign. The four seats are located in Dugout box 57, row 1, seats 1 - 4. Buy the tickets and parking package now $1,750. If interested please contact Dan Dunn, email fleadd@prodigy.net or text to 508-472-7922.